The portfolio websites of designers are often excellent sources of inspiration. Portfolio sites frequently demonstrate exceptional creativity and attention to detail, and they often showcase creativity and take some risks that may not be possible with other types of websites. In this post, we’ll take a look at what makes a portfolio site successful and we’ll feature 25 outstanding portfolio sites that are worth a look. You’ll find designs from a variety of styles here, including minimal, illustrated, nature-inspired, textured, brightly colored, and more. Whether you’re looking for inspiration to put to use in the design of your own portfolio site, or just want to browse some excellent websites, you’ll find something to like in this collection. For more inspiration, be sure to visit this post for free jQuery slider plugins. If you’re looking to create your own design portfolio, we recommend Shopify. Here is a look at some of the things that can be said of effective portfolio websites. Since a design portfolio website exists to show off the work of a designer or agency and to attract new clients, it only makes sense that the portfolio site itself should also be well designed. Visitors who are looking to find the right designer will be judging the quality of the portfolio site in addition to the items that are showcased within the portfolio. Just because a portfolio site needs to be well designed doesn’t mean that it must be extravagant. In fact, many effective portfolio sites take more of a minimalist approach to the design of the portfolio site itself, which can allow the images from items being showcased to take center stage. For some good examples, see this collection of minimal WordPress themes, which includes many portfolio themes. Many of the best portfolio sites, but not all, will showcase the creativity of the designer. Portfolio sites provide an opportunity for designers to take more creative risks and push the boundaries more than some other types of websites, like corporate sites for example. The portfolio site should not showcase every project the designer or agency has ever completed. Instead, it should showcase only the best work. Don’t let your best work get drowned out by a lot of other projects that don’t demonstrate your potential and ability. As a designer, you are working for the client, and there will be times when you may not agree with the decisions and choices made by clients. The result could be something that you’re not particularly proud of, but it is what the client wants. Make sure that the items you showcase in your portfolio only include the work that you are truly proud of. Ideally, your portfolio site should also provide some details about the types of services that you offer. There are all kinds of different designers out there, and some potential clients may want to know more about what you offer before contacting you. Most portfolio sites include a “Services” page or something similar where the descriptions of different services are provided. However, you decide to do it, be sure that potential clients are able to get an accurate idea of what you have to offer by quickly browsing your site. The main purpose of the portfolio website is to get inquiries from potential clients, so, of course, it should be easy for website visitors to contact you. Typically this is done with a contact form that can be completed right on the page. Some designers and agencies choose to also list a phone number and mailing address, but at the very least you should have a contact form or email address. This information and/or form can often be found on a “Contact” page, but sometimes it is just included as part of the “About” page. In order for a portfolio site to be effective, it will need to get the necessary exposure. If it is not seen by the right audience it cannot be effective at generating new business. There are a number of different ways that you can get exposure for a portfolio site, including being showcased in galleries like CSS Mania, social media sharing, blogging, and paid advertising. Maintaining a blog at the portfolio site will require some extra work, but it can be a great way to get traffic and to reach potential clients. Now that we have taken a look at some of the specifics of what makes a portfolio site successful, let’s look at some examples. The blue and white color scheme is somewhat simple but very pleasing. The icons add a nice visual touch and also help to show the types of services that they offer. Bio, portfolio items, and contact information are easy to find through the navigation menu. The responsive design looks great regardless of the screen’s width. The color scheme is appealing and it also stands out. Interesting illustrations are featured throughout the site. The design and layout is responsive, so the site looks great on any device. The services are clearly described and the “Services” page is included in the main navigation. Contact information included address, email, and phone number are easy to find. The design incorporates illustration and textures to create a very attractive look. The “Portfolio” page showcases several excellent projects, as well as details about specific services that were provided to each client. Contact information including an email address, contact form, and Skype handle are easily found. Links are also provided to social media profiles. This clean and somewhat minimal design looks great and keeps the portfolio items as the focus. All of the necessary information can be easily found through the main navigational items like “Portfolio”, “About”, and “Services”. The “Get in Touch” link also stands out. The design and layout are responsive, providing an excellent user experience on any device. The top of the homepage tells visitors exactly what services 2nd Floor offers. A sticky navigation menu keeps the most important links easy to access as you scroll down the page. The design and layout is responsive and mobile friendly. The portfolio shows a good selection of past projects without including too many (Currently, there are 14 items shown). This site has an attractive design that features a large blurred photo background, plenty of white space, a sticky and a sticky header. The portfolio gets plenty of attention with the red “See Our Work” button on the homepage. Services offered, bio information, and contact information are all easy to find from the primary navigation menu. The responsive layout adapts well to screens of various sizes. The header of this portfolio site is pretty unique and helps it to stand out from other portfolios. The work takes center stage and is really the only focus of the site. The portfolio is sorted by different types of projects (websites, interfaces, logos & icons. Contact information can be easily found through the main navigation. The scrolling effects are the element that stands out the most. The “Scroll Down” and arrow on the homepage make it clear to visitors what they should do. The blurred background photo and the images throughout the page all work well with the design. Bio and contact information are easily found when scrolling down. This dark, illustrated design is very memorable and distinct. The designer bio and portfolio items are easy to find through the main navigation. Links to social media profiles are also easy to find in the site header. The homepage video helps this site to stand out from other portfolios. Instead of simply displaying work samples, they provide case studies with more details on each client project. Contact information is easy to find. Bio information, work samples, and contact information can all be easily found through the navigation menu. This site’s layout is responsive. The sticky header makes navigation easy. Bio information and portfolio items are easy to find through the main navigation. They showcase several non-profit organizations that the company supports. This isn’t something that you’ll see on most portfolio sites, but it can help potential clients to look favorably on the company. The responsive design makes it easy to navigate on any device. The photos, graphics, and illustrations used throughout the site look great. The sticky header helps to make navigation easier. Bio, portfolio items, and service details can be easily found. The “Start a Project” link provides a clear way for visitors to contact the company. Case studies are provided to give detailed information about some client projects. Bright colors are one of the distinguishing features of this design. Services offered, work samples, and bio are easy to find. The responsive design looks great on any device. This site uses an interesting design and layout that is rather unique. Scrolling through the portfolio items using the up and down arrows proves to be a pleasant way to view the work samples. A lot of free space to insert sidebar or customize the design in your own way. The page does not load again and the menus are switchable very easily. The contact form is included on the homepage making it feasible for the viewers to connect quickly. Colorful sections are displayed on the homepage giving the whole page a unique look. Nice matte background and calligraphic fonts of different colors have been calibrated on the background of different colors. Footer is really clean and simple. Different categories and photographs have been displayed in a nice way. The work done has been presented in a simple way on a white background. The social media icons have been presented along with the other menus. Nice art and variety of calligraphic fonts. Suitable to be used for informational websites giving information about past times. All the things have been displayed in nice and colorful graphics. Each category has been displayed by the animated stars. The header and footer are very short and sleek. Sophisticated web design with sliders, sophisticated menu, color contrast along the page and a lot of other splendid features. The footer contains all the social media icons. One of the most important things a designer can do for his or her business is to create an attractive portfolio site that communicates effectively with visitors and draws in potential clients. We will look at various resources and articles that can help you to create the right portfolio site for you. We will look at several sources of portfolio design inspiration, tutorials that will lead you through the process of designing a portfolio, scripts that can be used, helpful articles and tips for portfolio design, and WordPress themes and HTML/CSS templates. Checking out examples of creative, effective portfolio sites from other designers can help to give you some ideas that you may be able to use in the design of your own portfolio. While many web design/CSS galleries include a lot of portfolio sites, there are some galleries that are focused exclusively on showcasing well-designed portfolios. The portfolio contains all type of web designs according to the niches. It contains the web designs featuring classic themes as well as sophisticated web designs equipped with advanced features. You can submit a web design of your own for promotional purposes. The comments section is also available for people to comment regarding each specific web design. There are a number of excellent tutorials that can help you by walking through the design of an example portfolio site. Many f these tutorials cover the design and layout work in Photoshop. Others involve coding or development. This tutorial teaches you to test the website before launching it at the end. You will also learn coding and the best way to present the website so that you can communicate your business goals to the audience easily. After mapping out an overview of the whole site, there are some simple customizations that you have to learn along with the placement of each category and section. A light dark color with suitable contrast throughout the page can be achieved if all the customizations are done properly. First, lay out the structure of the site and then start framing each category properly. The personal websites or about pages require to create such kind of web designs. Photoshop can be the great source to design and craft all the different kind of web designs manually. All the text and items need to be placed at proper distance uniformly to create an excellent CV/resume. Few small customizations will lead you to unbelievable results in the photoshop. Flash websites include quick and reliable options such as quick sliders or other such quick and sophisticated features. You will learn all the things including customizing the background, adding different menus and sections, creating a layout and customizing the site as a whole. The photoshop features that are used to customize the image can be used to create a web design from scratch or edit that web design. You will learn to design a unique background and practice the other basic things. The background has been created using the gradient tool and and by using the brush tool. If you know the basics of jQuery, then you are good to go with this tutorial. You will be working on the small details of all the coding material so you need to be careful. Sliders and image galleries are very common for use with portfolios. Adding one to your site can be very easy because there are many scripts available that you can implement very quickly into your own website. jQuery is the most suitable and reliable platform to code for the sliders to be used in different websites. Rather than listing all of the various sliders and galleries here, we recently published a post that featured 25 of them. Please refer to this post if you are looking for more options. The articles listed below will provide tips, advice, and information that can be very useful while you are working on creating a portfolio that will attract clients. For any designer who is looking to get more out of their portfolio, the articles on this list are must-reads. Many designers have chosen to use WordPress as a content management system to power their portfolio site. WordPress is a great option for a portfolio because it’s easy to work with and design for, it can power a blog as part of the portfolio site, there are tons of great plugins available for portfolio sites, and there are also a lot of themes that can be purchased that were created specifically with portfolios in mind. WordPress creators are amazingly talented people and you can use these themes to add some real value to your site. A professional looking theme that can be used by the vairety of professionals such as photographers and other digital content creators. Such sophisticated themes are not available for free but it is capable of catering and presenting tons of information in a precise way. You can edit the theme on your own and it can save a lot of your time if you will opt to design it from the scratch. You can completely customize the layout of the theme such as change the background and make an adjustment to other such details. 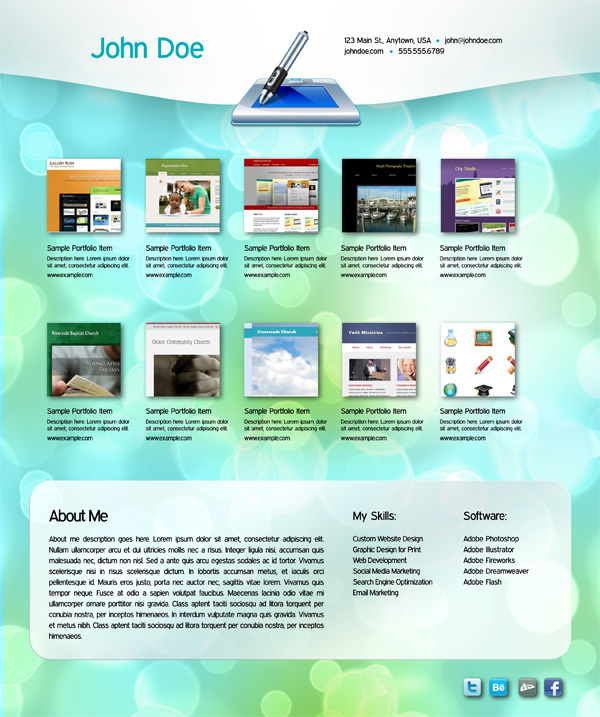 For those who do not want to use WordPress for their portfolio, there are also a number of HTML/CSS templates available. One-page themes are convenient for the viewers and designers as all the information is displayed on the single page. Minimal HTML site is faster than the usual sites as all the additional features have been designed with simple programming. Dark colored portfolio site for the people and you can do little customizations on your own to make it perfect for your own use. If you find yourself frequently exchanging emails with potential clients, you may be interested in sending them a PDF file that shows off your work. This free InDesign file will allow you to do just that. You can customize the file to include your own details and samples from your own portfolio, save it as an interactive PDF and email it to potential clients. This InDesign file has been created by The NetMen Corp and it can be downloaded for free. It comes in InDesign CS5 format, as well as an IDML file to convert it for InDesign CS4. The free font Expressway is used. To add your own portfolio items, save the .jpg files in the same folder as the InDesign file, select one of the existing thumbnails, open the links panel and click on re-link, then select your image. The social networking icons at the bottom can be linked to your own profiles. Select one of the icons and open the hyperlinks panel (Window > Interactive > Hyperlinks). When you are ready to save it as a PDF, go to File > Export and select Adobe PDF (Interactive). Exporting it at 300 ppi will give you the best image quality.